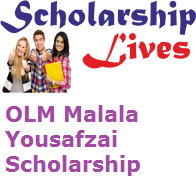 The OLM Malala Yousafzai Scholarship 2018-19 will soon available for all the women contenders only whose age should be 30 years who want to continue their intermittent studies in the Arts and Design field at the official website of the department. If you are also one of the eligible applicants then don’t take any type of stress and apply online the Malala Yousafzai Scholarship 2018-19 through the link which is mention below. The condition of Eligibility · The women from all over the world. · The age of candidate is 30 years old or more. Open to women applicants apply only. Interested in studying Arts and Design. $1000 scholarship to a woman. Next and the following step is to press on ‘Application Form’ option. Now the all eligible applicants must read the whole notification very carefully check the term and condition carefully. Now one must fill and submit the application form if find matching eligibility. After that, the applicants upload all the essential documents at the correct place. Now here at this last step of this process take 1 clear viewed copy to inform of a printout.